This was written by a former GM engineer. 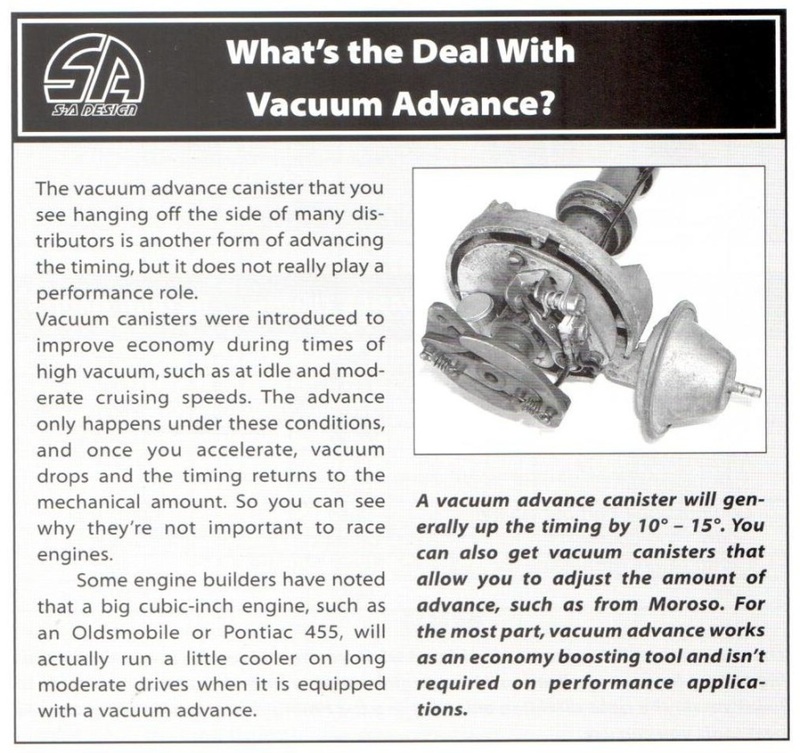 As many of you are aware, timing and vacuum advance is one of my favorite subjects, as I was involved in the development of some of those systems in my GM days and I understand it. Many people don't, as there has been very little written about it anywhere that makes sense, and as a result, a lot of folks are under the misunderstanding that vacuum advance somehow compromises performance. Nothing could be further from the truth. I finally sat down the other day and wrote up a primer on the subject, with the objective of helping more folks to understand vacuum advance and how it works together with initial timing and centrifugal advance to optimize all-around operation and performance. I have this as a Word document if anyone wants it sent to them - I've cut-and-pasted it here; it's long, but hopefully it's also informative. The most important concept to understand is that lean mixtures, such as at idle and steady highway cruise, take longer to burn than rich mixtures; idle in particular, as idle mixture is affected by exhaust gas dilution. This requires that lean mixtures have "the fire lit" earlier in the compression cycle (spark timing advanced), allowing more burn time so that peak cylinder pressure is reached just after TDC for peak efficiency and reduced exhaust gas temperature (wasted combustion energy). Rich mixtures, on the other hand, burn faster than lean mixtures, so they need to have "the fire lit" later in the compression cycle (spark timing retarded slightly) so maximum cylinder pressure is still achieved at the same point after TDC as with the lean mixture, for maximum efficiency. The centrifugal advance system in a distributor advances spark timing purely as a function of engine rpm (irrespective of engine load or operating conditions), with the amount of advance and the rate at which it comes in determined by the weights and springs on top of the autocam mechanism. The amount of advance added by the distributor, combined with initial static timing, is "total timing" (i.e., the 34-36 degrees at high rpm that most SBC's like). 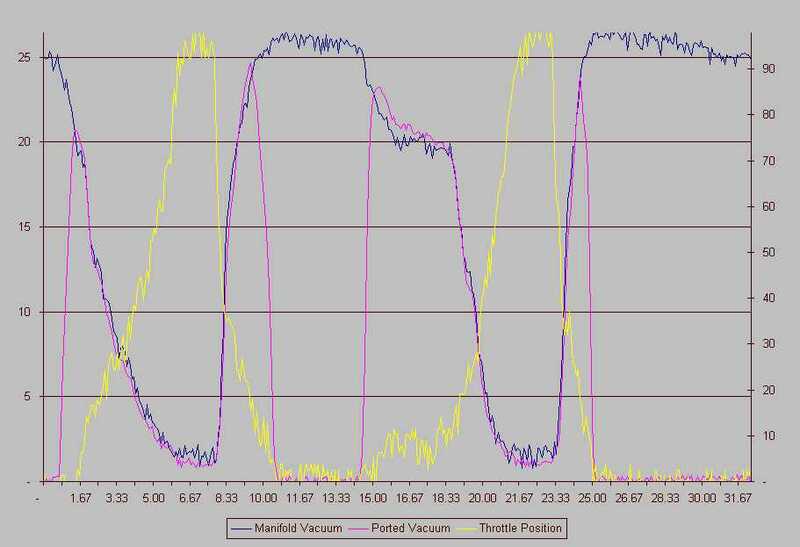 Vacuum advance has absolutely nothing to do with total timing or performance, as when the throttle is opened, manifold vacuum drops essentially to zero, and the vacuum advance drops out entirely; it has no part in the "total timing" equation. At idle, the engine needs additional spark advance in order to fire that lean, diluted mixture earlier in order to develop maximum cylinder pressure at the proper point, so the vacuum advance can (connected to manifold vacuum, not "ported" vacuum - more on that aberration later) is activated by the high manifold vacuum, and adds about 15 degrees of spark advance, on top of the initial static timing setting (i.e., if your static timing is at 10 degrees, at idle it's actually around 25 degrees with the vacuum advance connected). The same thing occurs at steady-state highway cruise; the mixture is lean, takes longer to burn, the load on the engine is low, the manifold vacuum is high, so the vacuum advance is again deployed, and if you had a timing light set up so you could see the balancer as you were going down the highway, you'd see about 50 degrees advance (10 degrees initial, 20-25 degrees from the centrifugal advance, and 15 degrees from the vacuum advance) at steady-state cruise (it only takes about 40 horsepower to cruise at 50mph). When you accelerate, the mixture is instantly enriched (by the accelerator pump, power valve, etc. ), burns faster, doesn't need the additional spark advance, and when the throttle plates open, manifold vacuum drops, and the vacuum advance can returns to zero, retarding the spark timing back to what is provided by the initial static timing plus the centrifugal advance provided by the distributor at that engine rpm; the vacuum advance doesn't come back into play until you back off the gas and manifold vacuum increases again as you return to steady-state cruise, when the mixture again becomes lean. The key difference is that centrifugal advance (in the distributor autocam via weights and springs) is purely rpm-sensitive; nothing changes it except changes in rpm. Vacuum advance, on the other hand, responds to engine load and rapidly-changing operating conditions, providing the correct degree of spark advance at any point in time based on engine load, to deal with both lean and rich mixture conditions. By today's terms, this was a relatively crude mechanical system, but it did a good job of optimizing engine efficiency, throttle response, fuel economy, and idle cooling, with absolutely ZERO effect on wide-open throttle performance, as vacuum advance is inoperative under wide-open throttle conditions. In modern cars with computerized engine controllers, all those sensors and the controller change both mixture and spark timing 50 to 100 times per second, and we don't even HAVE a distributor any more - it's all electronic. Now, to the widely-misunderstood manifold-vs.-ported vacuum aberration. After 30-40 years of controlling vacuum advance with full manifold vacuum, along came emissions requirements, years before catalytic converter technology had been developed, and all manner of crude band-aid systems were developed to try and reduce hydrocarbons and oxides of nitrogen in the exhaust stream. One of these band-aids was "ported spark", which moved the vacuum pickup orifice in the carburetor venturi from below the throttle plate (where it was exposed to full manifold vacuum at idle) to above the throttle plate, where it saw no manifold vacuum at all at idle. This meant the vacuum advance was inoperative at idle (retarding spark timing from its optimum value), and these applications also had VERY low initial static timing (usually 4 degrees or less, and some actually were set at 2 degrees AFTER TDC). This was done in order to increase exhaust gas temperature (due to "lighting the fire late") to improve the effectiveness of the "afterburning" of hydrocarbons by the air injected into the exhaust manifolds by the A.I.R. system; as a result, these engines ran like crap, and an enormous amount of wasted heat energy was transferred through the exhaust port walls into the coolant, causing them to run hot at idle - cylinder pressure fell off, engine temperatures went up, combustion efficiency went down the drain, and fuel economy went down with it. If you look at the centrifugal advance calibrations for these "ported spark, late-timed" engines, you'll see that instead of having 20 degrees of advance, they had up to 34 degrees of advance in the distributor, in order to get back to the 34-36 degrees "total timing" at high rpm wide-open throttle to get some of the performance back. The vacuum advance still worked at steady-state highway cruise (lean mixture = low emissions), but it was inoperative at idle, which caused all manner of problems - "ported vacuum" was strictly an early, pre-converter crude emissions strategy, and nothing more. What about the Harry high-school non-vacuum advance polished billet "whizbang" distributors you see in the Summit and Jeg's catalogs? They're JUNK on a street-driven car, but some people keep buying them because they're "race car" parts, so they must be "good for my car" - they're NOT. "Race cars" run at wide-open throttle, rich mixture, full load, and high rpm all the time, so they don't need a system (vacuum advance) to deal with the full range of driving conditions encountered in street operation. Anyone driving a street-driven car without manifold-connected vacuum advance is sacrificing idle cooling, throttle response, engine efficiency, and fuel economy, probably because they don't understand what vacuum advance is, how it works, and what it's for - there are lots of long-time experienced "mechanics" who don't understand the principles and operation of vacuum advance either, so they're not alone. Vacuum advance calibrations are different between stock engines and modified engines, especially if you have a lot of cam and have relatively low manifold vacuum at idle. Most stock vacuum advance cans aren’t fully-deployed until they see about 15” Hg. Manifold vacuum, so those cans don’t work very well on a modified engine; with less than 15” Hg. at a rough idle, the stock can will “dither” in and out in response to the rapidly-changing manifold vacuum, constantly varying the amount of vacuum advance, which creates an unstable idle. Modified engines with more cam that generate less than 15” Hg. of vacuum at idle need a vacuum advance can that’s fully-deployed at least 1”, preferably 2” of vacuum less than idle vacuum level so idle advance is solid and stable; the Echlin #VC-1810 advance can (about $10 at NAPA) provides the same amount of advance as the stock can (15 degrees), but is fully-deployed at only 8” of vacuum, so there is no variation in idle timing even with a stout cam. For peak engine performance, driveability, idle cooling and efficiency in a street-driven car, you need vacuum advance, connected to full manifold vacuum. Absolutely. Positively. Don't ask Summit or Jeg's about it – they don’t understand it, they're on commission, and they want to sell "race car" parts. Many people who tune engines disconnect the vacuum advance mechanism, and indeed on some distributors it is very hit and miss in operation and can cause anomalies in the timing. All in all however for a road engine, the vacuum advance retard should be retained if it is possible to do so (not always easy with sidedraught carbs). This will have a dramatic affect on economy and driveability especially on small throttle openings and when 'off-cam'. Mocht je toch voor een andere ontsteking gaan kijken, houdt er dan rekening mee dat je 2 verschillende soorten hebt: Met en zonder vacuumvervroeging. Beide hebben hun voor- en nadelen. Met vacuumvervroeging is een ontsteking voor op straat. De ontsteking sluit perfect aan wanneer je op de snelheid rijdt of eigenlijk elke snelheid op een vast toerental. Maar voor maximum vermogen is het net wat minder precies als een ontsteking zonder vacuumvervroeging. Dat gezegd hebbende is een ontsteking zonder vacuum vervroeging weer een stuk minder op vaste snelheden. Denk aan een iets moeilijker lopende motor op vaste snelheden en een hoger benzineverbruik. Het beste kun je kiezen voor een ontsteking met vacuumvervroeging. Hierdoor mis je geen enkele drivability die je met een ontsteking zonder vacuumvervroeging wel zult missen. Of je stapt toch over naar een elektronische ontsteking, zodat je het beste van 2 werelden hebt . After logging several hundred miles with both Firebirds in their final states of tune, we are completely satisfied with the results. We were able to tame a radical camshaft and dramatically improve temperament with manifold-vacuum advance in one combination. In these instances, the long-duration camshafts required for high-rpm operation have excessive valve overlap, which tends to dilute the incoming mixture with residual exhaust gas. Additional spark lead provides extra time for a more complete burn of the mixture in each cylinder. We also found that relatively stock combinations with limited modifications do not always benefit from manifold-vacuum advance, especially if the carburetor's idle circuit has been modified. It appears that in these instances manifold-vacuum advance will not always improve street manners but can smooth idle. Ported-vacuum advance can then be used to improve part-throttle response and overall fuel economy. If the original carburetor is unmodified or a different carburetor is used entirely, manifold-vacuum advance will likely provide noticeable improvements in all operating ranges. There is one constant generality about vacuum advance that likely applies to every combination: A suitable amount (whether manifold or ported) can noticeably increase part-throttle response without any negative aspects. But because most of our engines are modified in some manner, neither form is necessarily "correct" for any vehicle. Since vacuum advance offers such distinct advantages for any car driven on the street, we suggest experimenting with both forms to determine which works best for your specific application. Once you find the right combination, you'll wonder why you waited so long to perform your own vacuum-advance experiment! Een kopie uit 'How to build high-performance ignition systems van Todd Ryden. Wat ik hier voornamelijk interessant aan vind is de vermelding dat sommige motoren wat koeler blijven door vacuum vervroeging. - Voor weggebruik is vacuumvervroeging aan te raden. - Sluit de vacuumvervroeging van de ontsteking direct op het vacuum van het spruitstuk aan en niet op ported-vacuum. - Vacuumvervroeging geeft géén vermogenswinst maar zorgt er voor dat de motor stationair (mits aangesloten op het spruitstuk) en in deellast soepeler en economischer loopt. - Het is voor elke auto anders, je zult moeten experimenteren voor het juiste resultaat. In bovenstaande grafiek is heel duidelijk het verschil tussen ported vacuum en manifold vacuum te zien. Bij ported vacuum valt de vacuum-vervroeging direct weg als de gasklep dicht staat. Bij stationair toerental is er dus géén vacuum-vervroeging bij ported vacuum. Zodra de gasklep iets open gaat (rond 14:00 in de grafiek) komt het vacuum gelijk weer in en dus ook de vervroeging van de ontsteking. Het niet aanwezig zijn van vacuum bij gesloten gasklep (stationair loop) is het enige verschil tussen manifold vacuum en ported vacuum.